‡ Both authors contributed equally to this study. 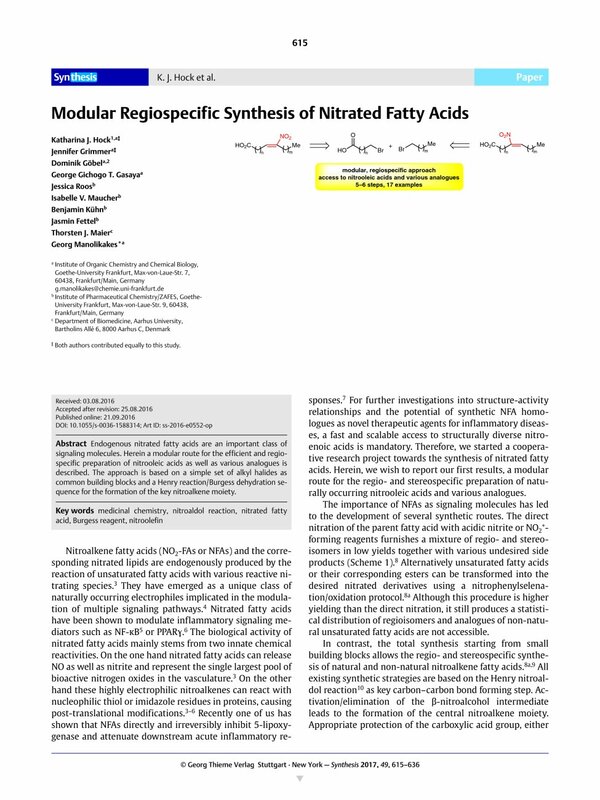 Endogenous nitrated fatty acids are an important class of signaling molecules. Herein a modular route for the efficient and regiospecific preparation of nitrooleic acids as well as various analogues is described. The approach is based on a simple set of alkyl halides as common building blocks and a Henry reaction/Burgess dehydration sequence for the formation of the key nitroalkene moiety. Supporting information for this article is available online at http://dx.doi.org/10.1055/s-0036-1588314. 1 New address: RWTH Aachen University, Institute of Organic Chemistry, Landoltweg 1, 52074 Aachen, Germany. 2 New address: University Bremen, Institute of Organic and Analytical Chemistry, Leobener Straße NW2 C, 28359 Bremen, Germany. 28a The configuration of the double bond isomers was assigned by 1H NMR spectroscopy and comparison with analytical data reported in the literature. 28b See also ref. 9.